With an awesome wind machine, the capability of handling up to 10 guests, the party booth is our most popular choice. Our booths are priced competitively and If you book a booth from us you will be in good company, we were booked for Danny Dyer’s wedding, John Bishop’s 50th, Alan Shearer’s 40th, Paul McCartney’s family, Simon Cowell’s celebration in the South of France plus many more. Our photo booths come with wedding guest books for your guests to leave hand written personal messages next to their photos (along with having a personalised print for themselves to take home) and the latest features to keep your guests entertained throughout the event. We will handle the set up and take down of the photo booth along with a photo booth butler to provide you with convenience and a fun wedding. We also offer free nationwide coverage on all of our photo booth hires. 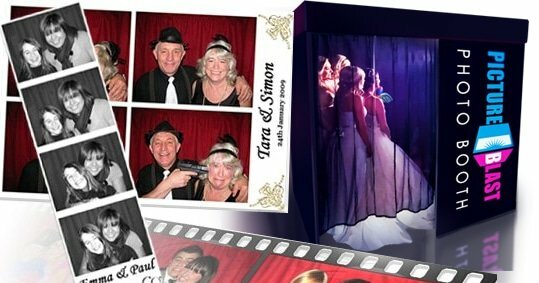 • Ideal solution for your wedding entertainment along with capturing memories of you and your guests. • Free nationwide coverage on all photo booth hires. • Everything you could want with your photo booth hire is is included, nothing extra to pay for. •UK’s longest running photo booth hire company, established October 2008. Take a look at testimonials here from our customers and see what they think of our photo booths and service. No hidden costs, no travel charges. Everything you could possibly want from your photo booth is included in the price!